This one has been on my personal wishlist for a long time. I check Google Adsense everyday through an iPhone app. But, it doesn’t give the same sort of info I am used to getting out of the web interface. 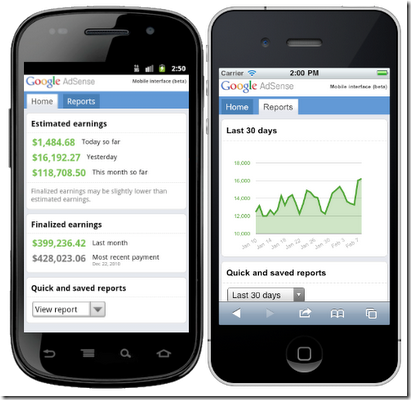 Google has just announced a mobile interface for Adsense. It is designed to give us quick access to essential information. After signing in, you are greeted with today’s eanings and total unpaid earnings so far. The Reports tab gives you a quick look at the past week’s adsense performance in a graph. You can also change that to see Last 30 days, This month or last month report. Just make sure you have opted to the new Google Adsense interface in desktop before you try this on your mobile. The mobile interface is still in it’s infancy and we can expect to see more features. Hadn’t spotted this one, will check it out! THanks for heads up!